n. The main part of a plant or animal. The main or principle part. The body is the obvious and central element to why we are here. And ironically, despite the body's very ever-present nature, I have had the hardest time writing this post. Everything I wrote felt off the mark; too esoteric, too heady, which should tell me something about my own relationship to my body. It has taken me years to become comfortable in my body. And even now, I still have twinges of uncomfortableness, not sure it is safe to fully be in my body. Why is that? Surely there were things as I was growing up that encouraged disassociation rather than connection to my body. But it is not becasue of bad childhood tales that I am not always comfortable in my body. This denigration and distrust, especially of the female body is a larger Western cultural phenomonon that has been reinforced subtly and loudly over the years, so much so that I hardly realize its truth. The Western mind has been seperate from the body and its consequences are vast. It allows for violence towards others and toward the land. It allows for violence against ourselves in the form of how we talk to ourselves. It dissasociates our inner knowledge and sophistacted response system to authorites outside of ourselves. The other day my husband forwarded me this article written by Jack Kornfield that expressed so beautifully the path and challenges to becoming whole. Kornfield spoke of "attending to the mandala of our being." What a beautiful and inclusive phrase. And our body is the center of this mandala. It is the vehicle that allows us to experience life and attend to our emotional, physical, and spiritual development. As I was creating paintings for this body of work BOUND, I started with the abstract and ended up in the body. As I was looking into understanding my own operating system, I contemplated my rational mind, my shadow, my reasoning capabilities for discernment, and my own screens. 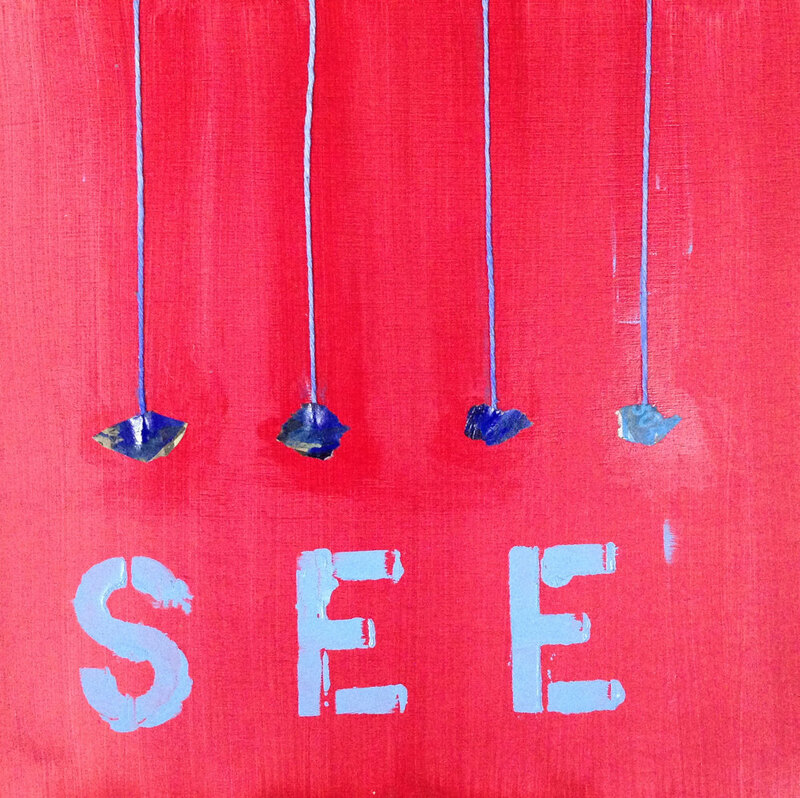 But the last paintings I made for this show were Body and the five senses, Taste, Touch, Smell, Hear, and See. These paintings were inspired by an image I ran across in a book of symbols. It described the human system of consciousness as a chariot and charioteer with five forses. The chariot was the body, the charioteer our consciousness and the horses our five senses and the reigns our mind/thoughts. Such a simple metaphor that clearly illuminated the structure of the body, mind and soul. 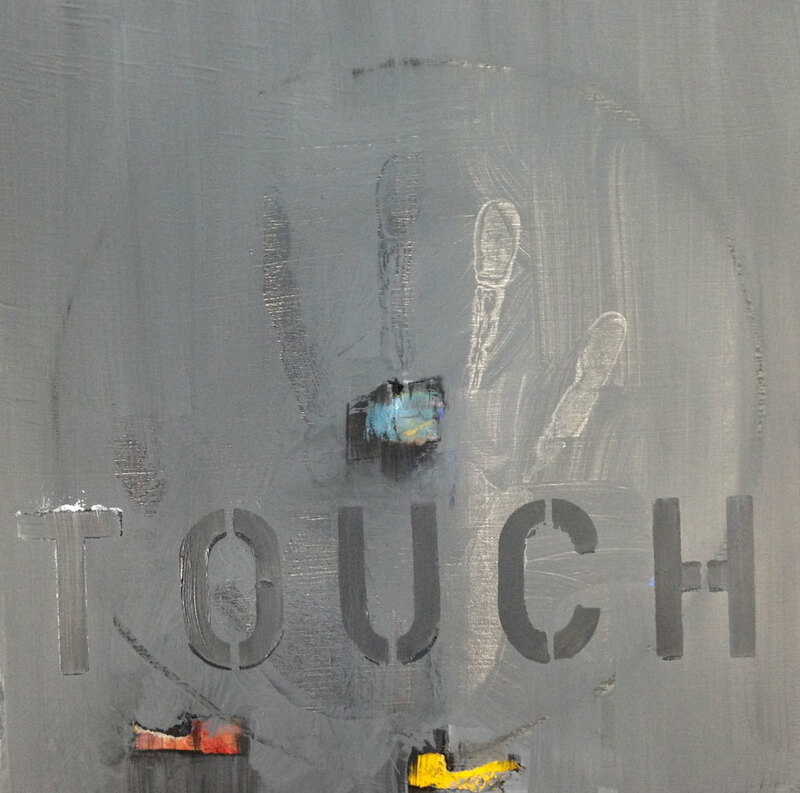 I created the painting Body by physically adding prints of my hands-the oldest form of human mark making. This act reinforced the truth that my body is the central mechanism to connect me to my world and creativity is what allows me to know, understand and express my experiences in the world. Such simple truths but it seems these truths get drowned out in a culture of consummerism, disassociation and pain. I then created the five sense. I felt the need to be very clear about this structure of the body and how our senses create our understanding of the world. It was a way for me to see clearly the structure of the body and contemplate the amazing system of senses we are gifted with in order to experience life. On the anniversary of September 11th, I feel it is even more relevant to remember the body as a sacred vessel, one that is to be cared for personally, and as we do so, allows us to connect with others. In order to create peace in the world, we must be in a healthy relationship with ourselves, and then with each other. This first and foremost happens through attending to our body.